The remaining 15 prayer wheels are still on order from Nepal. Telephone and email contact is very erratic and we are still waiting to hear when they will be delivered. Meanwhile Kunga and Yeshe are continuing to to saffron and roll the sheets of mantras which fill the prayer wheels. At present it is not possible to turn the wheels as dust from he building work has entered the internal mechanism, and the plan to go "electric" has to wait until all the wheels are in place. Forceful representations have been made to the Road Safety authorities to establish a speed limit on either side of Samye Ling so far to no avail. In order to protect the Prayer Wheel house from another bull dozing by logging lorries we are erecting a metal safety barrier along the road which will eventually be camouflaged by beach hedges. This should be in place very soon. During the recent gales two lengths of the prayer flags that decorate the four sides of the Stupa and which are held by ropes to the top of the spire were blown down. We hope to have these reattached on new ropes gales and weather permitting before the winter sets in. The Statue of Guru Rinpoche in the Fountain of Blessings is in the process of being repainted by Chokyi Zangmo and the surrounding pond is to be tiled with small blue tiles which have been sponsored. It is hoped that his work will be completed by next spring. Firemen cut the driver, remarkably unscathed, free from his cab. 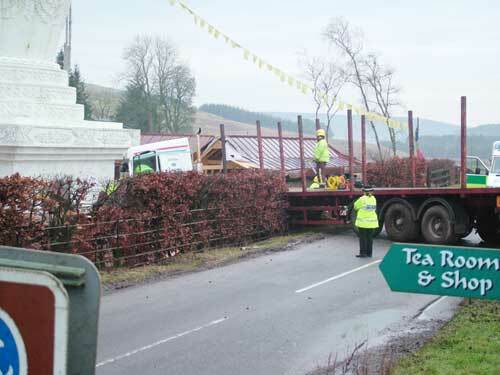 On the morning of December 9th an unladen logging lorry skidded on some black ice on the narrow valley road that passes Samye Ling, careered through the hedge into the prayer wheel house and brought the whole structure down. 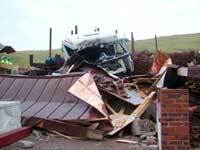 Miraculously no one was killed. If you would like to sponsor a Prayer Wheel or the mantras within it is still possible to do so. The most positive way of responding to this event is to be thankful that the Prayer Wheel House protected the Stupa and that no one was seriously injured. 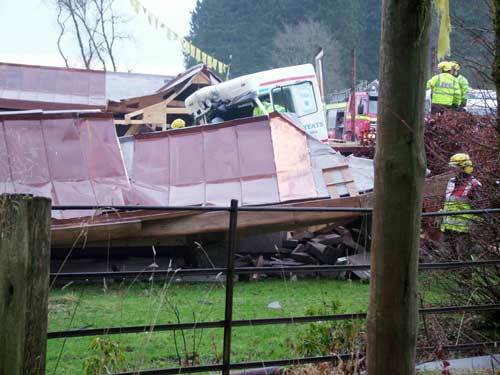 However, this accident was the second demolition of a building by a logging lorry to occur on this road within the year. Samye Ling is one of the most visited tourist sites in Scotland. Hundreds of residents and visitors walk our valley every week. The whole valley has been campaigning for several years for a speed limit and ultimately the rerouting of these juggernauts which take 75 yards to brake effectively. Their speed down the narrow valley roads, regularly in groups of two or three, often exceeds 40 MPH. Our local roads are far too narrow to accommodate these heavy vehicles, laden or unladen. Smaller vehicles, bicycles and walkers are at constant risk. In wet weather it is a common occurrence for lorries to pass walkers at speed and drench them with black mud from head to toe. Road surfaces are potholed from the extreme weight of the lorries and the roadsides are ditched and eroded as the lorries take to the verges to avoid oncoming traffic. In Galloway the danger posed by these giants has posed such a threat to residents and tourist complaints have been so numerous that a railway is being built to carry the timber. We strongly urge readers to petition the local logging companies, local government and the Scottish Parliament to enforce the rerouting of their trucks using the money set aside for this project which has already been given and approved by the European Union and the Scottish Parliament. At the very least a 20 MPH speed limit should be observed throughout the valley by heavy vehicles.We need your prayers and support in whatever way you can give it.